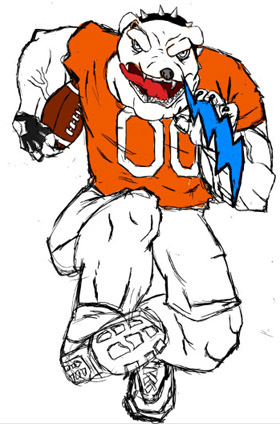 An Artesia Bulldog catches a bolt of lightning as he charges upfield in this drawing by Artesia High School junior Maegan Lemon. The Bulldog football team will take on the Class 6A second-ranked Cleveland Storm for the first time in the programs’ history at 7 p.m. today at Bulldog Bowl. New Mexico high school football fans looking for a little excitement midway through the regular season need look no further than Bulldog Bowl at 7 p.m. today. There, the defending Class 6A and Class 5A state champions – the Cleveland Storm and Artesia Bulldogs – will be squaring off for the first time in the programs’ history. And while little is on the line in terms of the big picture, there’s no doubt the eyes of the state will be on the clash of the large-class titans. The two squads also enter tonight’s contest with unblemished records of 4-0 and healthy win streaks dating back to 2015 (17-0 for the Storm, 11-0 for the ‘Dogs). And while the matchup is also technically one of the fan-favorite North vs. South variety, there’s a healthy dose of the latter behind the scenes at Cleveland, most notably via head coach Heath Ridenour, a former standout at Lovington High School. “There are quite a few southern roots in that staff,” Henderson said, “so it’s set up well to be successful. They understand southern football, and probably at least two or three coaches have been to a game in the Bowl, so they kind of know what they’re getting into, at least as a staff. The Storm kicked off their 2016 campaign with a 24-14 win over Onate, then edged La Cueva in their home opener, 38-37. They remained in Rio Rancho Sept. 9 to top Las Cruces High 49-41 in a game that saw Cleveland rush for 371 total yards, 127 of those and five touchdowns coming courtesy of senior back Shawn Nieto. The boys in aqua then headed back to the Field of Dreams last week to take on Centennial, whom Artesia defeated in last year’s 5A title tilt. The Storm were able to build a quick 21-0 lead by the early second quarter, with running back Mike Papadopoulos scoring to start the game in a drive that began from the Hawk 11 after Centennial’s punter failed to get the ball away. A one-yard run by Nieto on fourth and goal was then followed by a 43-yard touchdown pass from junior quarterback Angelo Trujillo to Daniel Johnson. The Hawks regained their composure and were able to make it a one-touchdown game at the half, 28-21, and nabbed an interception to start the third quarter. But another failed punt in Centennial territory set up a second quick TD for Papadopoulos. And after the Hawks pulled within striking distance again, 35-27, an 80-yard touchdown from Trujillo to Johnson on the flea flicker effectively sealed the deal in the 49-33 victory. Johnson finished with 195 yards receiving on the night, proving the Storm capable of airing it out when need be. Their preference, however, is to pound it out on the ground. “They’ll probably start out spread, which is kind of what they’ve been doing, but they like to get in sets where they can really make sure they can run the ball,” said Henderson. “Their quarterback is probably one of the better runners, so they have a dual thread in the backfield. They throw the ball well, too, when they need to. Defensively, however, Cleveland has given up nearly as many points as they’ve scored – 160 to 125 – on the season thus far, particularly to throwing teams. The Storm are also stout on the lines, with 6’5”, 285-pound and 6’5”, 271-pound seniors Daimon Altamirano and Hayden Wilson looming large on the offensive side. “They’re big,” Henderson said. “They have good size this year in a lot of places, and they move well. So that’s a good combination to have. That’s any coach’s dream, and they play to those strengths. They stop the run well on defense, and they run well on offense. The Bulldogs, meanwhile, have made short work of their first four opponents of the season in games marked by big plays on both sides of the ball. They’ll be looking tonight to see if they can maintain that level of play against their toughest test to date. “We’ve got to be disciplined,” Henderson said. “We’ve been able to really just shut people down pretty quickly on defense and score quickly on offense the last few weeks, and while the game plan is certainly to still do that, it may not happen against a quality opponent like this. So we’re going to have to play disciplined football and make sure we do all the little things well – going full speed snap to whistle and just playing the way that we play in Artesia.